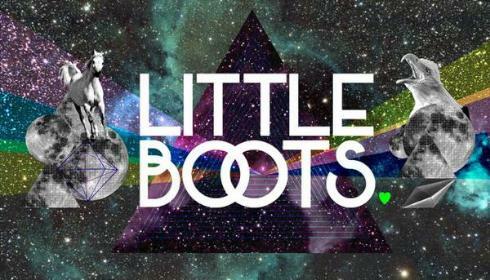 In one form or another, I’ve been banging on about Little Boots since 2005 featuring her old band on cduk.com, getting ‘Stuck On Repeat’ played on Radio 1 and generally pimping her out to any media outlet I possibly could. Now, signed to a major deal on Atlantic Records, and appearing on this week’s Jools Holland, 2009 will no doubt be her year. As part of a feature about new female popstars I worked on for Attitude with gaypop, I interviewed Victoria for the mag and here it is. FYI my other selections for the main feature were Lady Gaga, As In Rebekka Maria and Janelle Monae. Little Boots is as small as Kylie. She’s also going to be just as big. Her mission statement is to create epic disco pop and from what we’ve heard, she’s the best thing to come out of Blackpool since Chris Lowe put on his tight yellow sweater. We first met ‘Boots, or to give her her real name, Victoria, as part of glamourous Leeds indie band Dead Disco back in 2005. Like an evil version of Girls Aloud, their super catchy tunes, and Victoria’s presence as a frontwoman was incendiary. Despite getting signed up to a major label she decided to go solo late last year, waved goodbye to the illuminations, headed to East London and leaked her first song onto the internet. This was the suitably epic ‘Stuck on Repeat’ and almost immediately bloggers fell in love. Produced by Hot Chip’s Joe Goddard, it was 7 minutes of pulsating disco euphoria peppered with sleigh bells and a hypnotic vocal that got world class DJs like Pete Tong straight on the phone. But Victoria didn’t want to rush things. As we talk to her in the middle of London Fashion Week, she’s hungover from her very first live performance in front of friends in her studio last night. Instead of getting straight on the road, she’s been writing her debut album with the likes of Greg Kurstin and Pascal Gabriel and learning to DJ. Arriving in London she was skint and after learning to spin some tracks in a pub, she went out as tour DJ for the Wonky Pop Tour and now finds it hilarious that people are flying her to America to play gigs as some amazing electro DJ . Epic certainly seems to be where it’s at when Victoria tells us about her live show. As well as geeking it up with lots of synths, a Theremin, stylophone and an amazing Tenori-On she’s also got lasers, smoke machines and fake wolves and owls with eyes that light up! Planning to make the shows as extravagant as possible once the money starts rolling in, the dream is to travel up to space and do a gig with Richard Branson in orbit. Obviously! Watch Little Boots on this week’s Jools Holland doing a very melancholic version of ‘Stuck On Repeat’.